On the streets of 17th-century Paris, law and order is more a fledgling idea than reality, and the Musketeers, Athos, Aramis and Porthos, are far more than merely royal bodyguards for King Louis XIII. They are inseparable, loyal unto death and committed to upholding justice. Together, this crack team of highly trained soldiers fight for honour, for valour, for love, and just for the pure thrill of it. When D’Artagnan arrives in Paris to..
Own The Musketeers Series 1 to 2 DVD from Deff, DVD, Blu-Ray & 4K Video Specialists - Free UK Delivery..
Series 1: On the streets of 17th century Paris, law and order is more a fledgling idea than reality, and the Musketeers, Athos, Aramis and Porthos, are far more than merely royal bodyguards for King Louis XIII; they are inseparable, loyal unto death and committed to upholding justice. 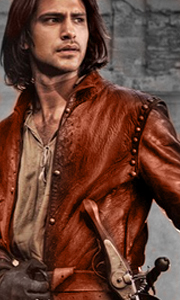 Series 2: As France teeters on the brink of war with Spain, the death of Cardinal Richelieu has left a void that could yet be filled by an even darker thr..
Own The Musketeers Series 1 to 3 Complete Collection DVD from Deff, DVD, Blu-Ray & 4K Video Specialists - Free UK Delivery..
A dark new chapter unfolds… The Musketeers return in a stunning second series that explodes from the screen with more thrills, action and adventure than ever before. As France teeters on the brink of war with Spain, the death of Cardinal Richelieu has left a void that could yet be filled by an even darker threat. More mercurial and combustible than the Cardinal, Rochefort has a concealed agenda that may bring the whole realm to ruin. Vi..
A country at war. A city in crisis. Heroes on the battlefield, the Musketeers return from the Spanish front to a Paris seething with resentment, a city on the brink of starvation. The corrupt Governor Feron has been running the capital for his own ends, aided by the brutal Red Guard. But behind Feron hides an even greater menace. Lucien Grimaud is a vicious gangster with a powerful hold over the governor. While Feron might be reasoned w..
Tom Burke, Luke Pasqualino, Alexandra Dowling and Peter Capaldi are among the stars of this BBC drama inspired by Alexandre Dumas's novel 'The Three Musketeers'. Set in 17th century Paris, the show follows the musketeers, Athos (Burke), Aramis (Santiago Cabrera), Porthos (Howard Charles) and D'Artagnan (Pasqualino), as they set about defending their queen (Dowling) from threats to her throne and the nation of France as a whole. Sources ..
Own The Musketeers Series 2 DVD from Deff, DVD, Blu-Ray & 4K Video Specialists - Free UK Delivery..
Own The Musketeers Series 3 DVD from Deff, DVD, Blu-Ray & 4K Video Specialists - Free UK Delivery..